Is the seat too tight a fit? 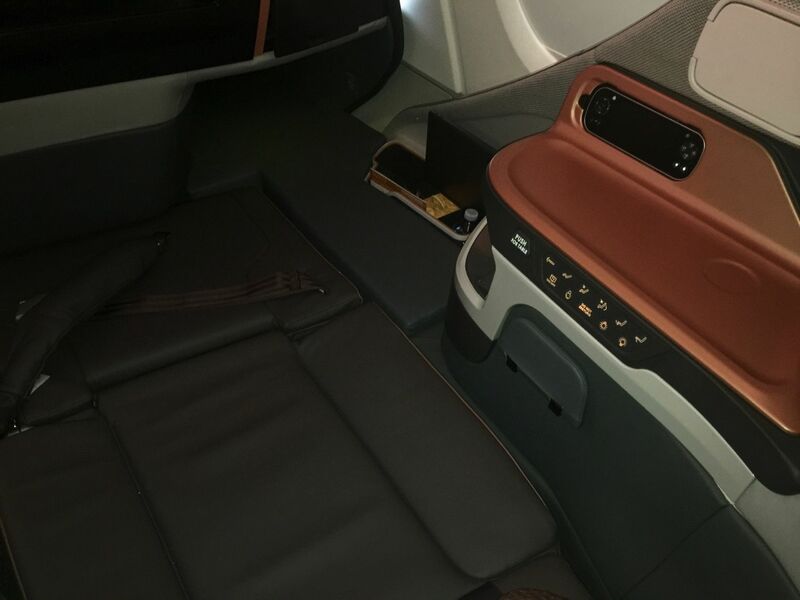 It may be the tail end of 2017, but Singapore Airlines’ all-new business class seat should be badged as a 2018 product. That’s the year in which this seat will really take off, on all five of the Singaporean flag-carrier’s factory-fresh Airbus A380s as well as the first upgrades of its existing superjumbo fleet. 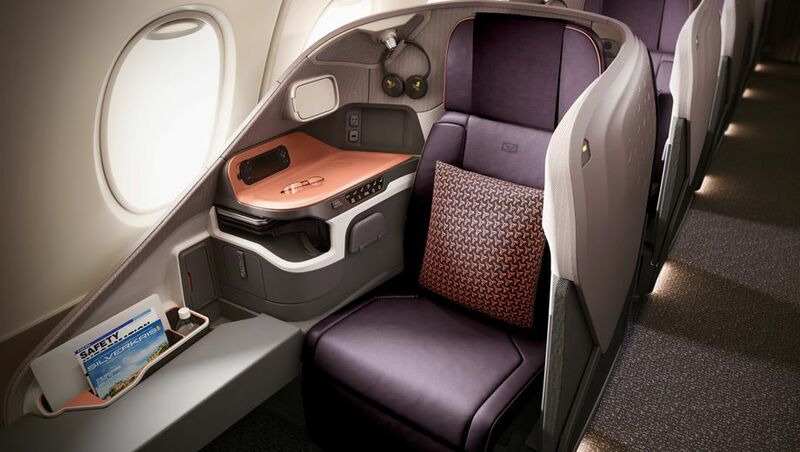 By the time we get to the end of 2020, this will be Singapore Airlines’ flagship business class seat – complemented by the ‘Next Gen’ design seen on the long-range Airbus A350 and Boeing 777-300ER fleets, and the new regional business class seat of the Boeing 787-10 and medium-range Airbus A350s. Singapore Airlines clearly has high hopes for this new design, which may have its roots in the original A380 business class benches but is very much its own product. 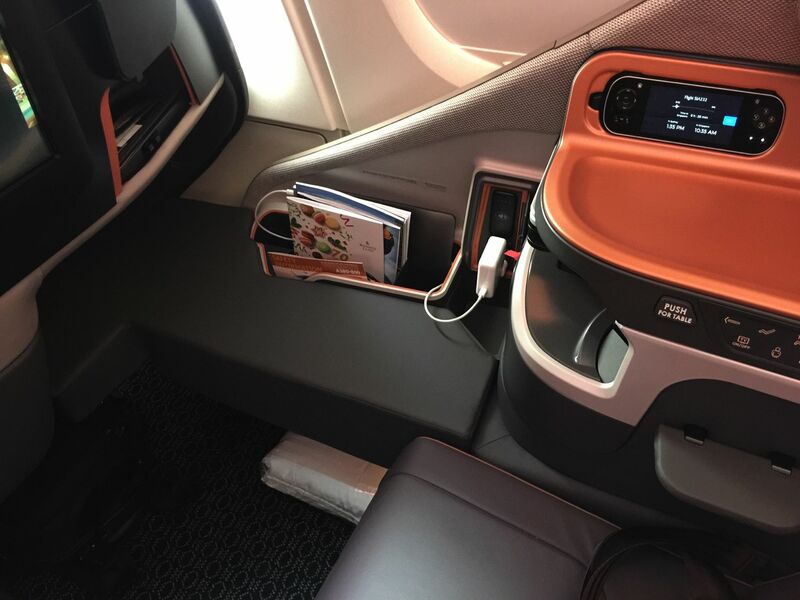 When Australian Business Traveller tested the seat on its debut Sydney-Singapore route, we found plenty to like – but sprinkled with a few bothersome shortcomings. 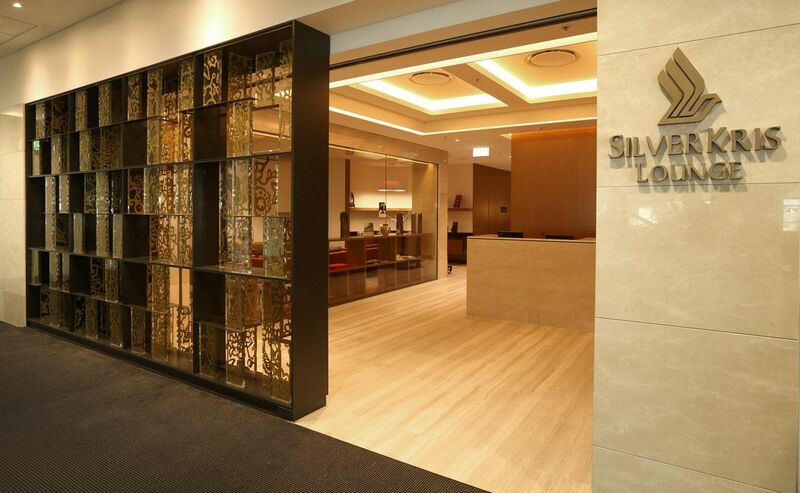 Any Singapore Airlines business class flight out of Sydney begins with a spell at the SilverKris lounge, which has a relaxed ‘residential’ design. … and some handy ‘productivity pods’ for getting last-minute work done. Just be aware that the lounge’s free (password-protected) WiFi is painfully slow and has sporadic stop-and-go tendencies. The easy fix: log onto the substantially faster and more stable WiFi network of the Air New Zealand lounge, which is just next door. There’s enough signal soaking through to get a decent connection, especially if you’re sitting up near the windows. At the time of writing there’s no password protection on the AirNZ wireless network, but if that changes you can just duck into the AirNZ lounge and ask for the password. 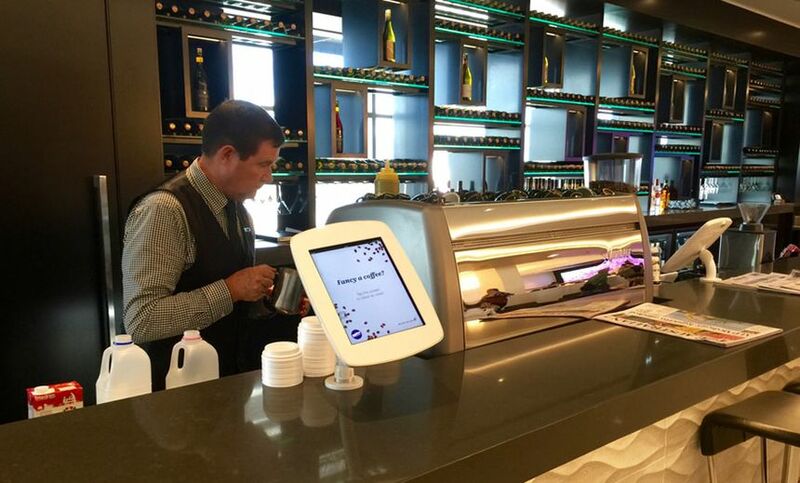 The other thing you’ll want to get from the Air New Zealand lounge (maybe while you’re grabbing that password) is a coffee: the Kiwi lounge has a proper barista service (below), unlike the press-button pour of the coffee machine in the Singapore Airlines lounge. 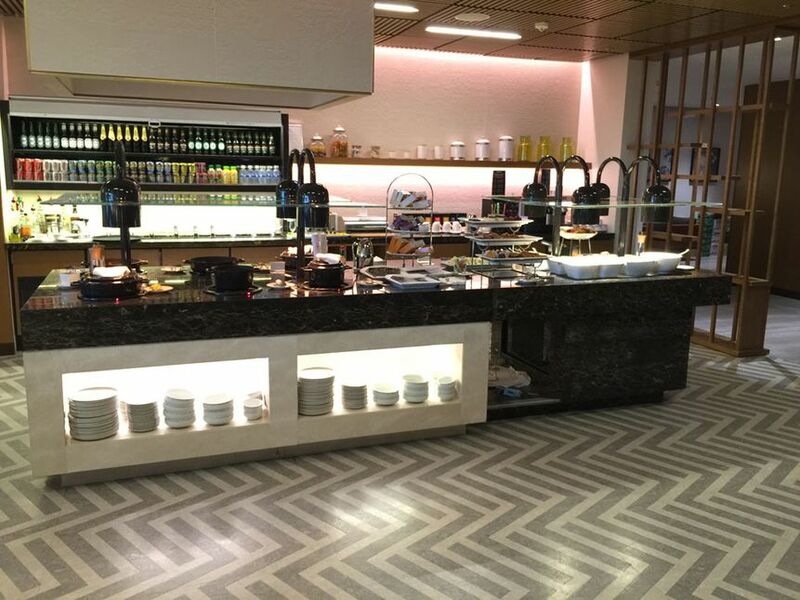 It’s not uncommon to see SQ passengers wandering back from the Air New Zealand lounge with a take-away coffee in hand. 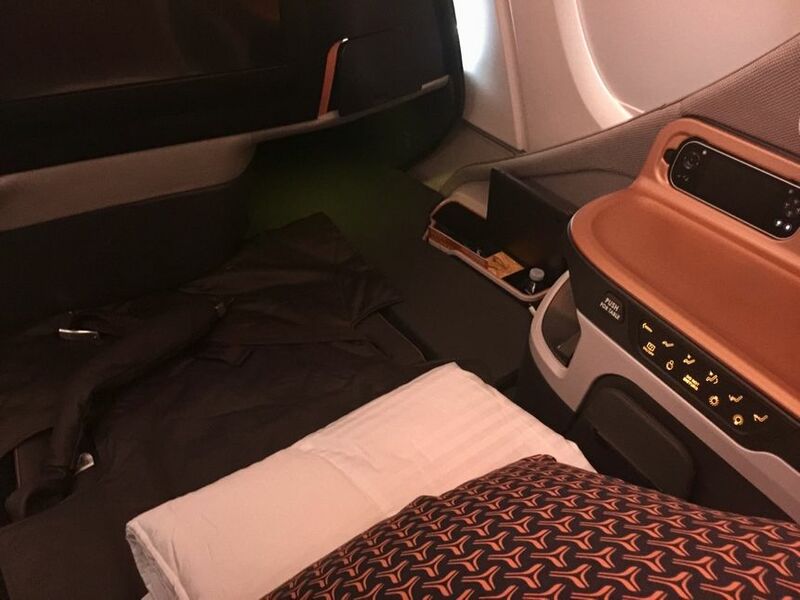 Singapore Airlines' new A380 layout sees 78 business class seats stretched along the upper deck, divided into two cabins – the main one is the largest with 50 seats, followed by a smaller secondary cabin of 28 seats. It’s the now-standard 1-2-1 arrangement so that every passenger has immediate access to the aisle. 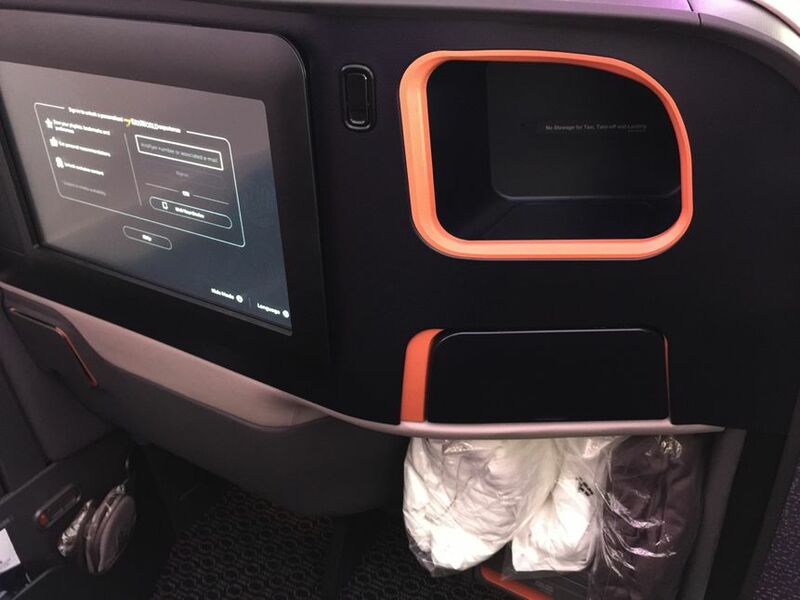 The alignment of the window and middle seats are offset so that, combined with the high wrap-around seat shell, there’s exceptional privacy without cutting you off from the rest of the cabin and of course the attentive crew. 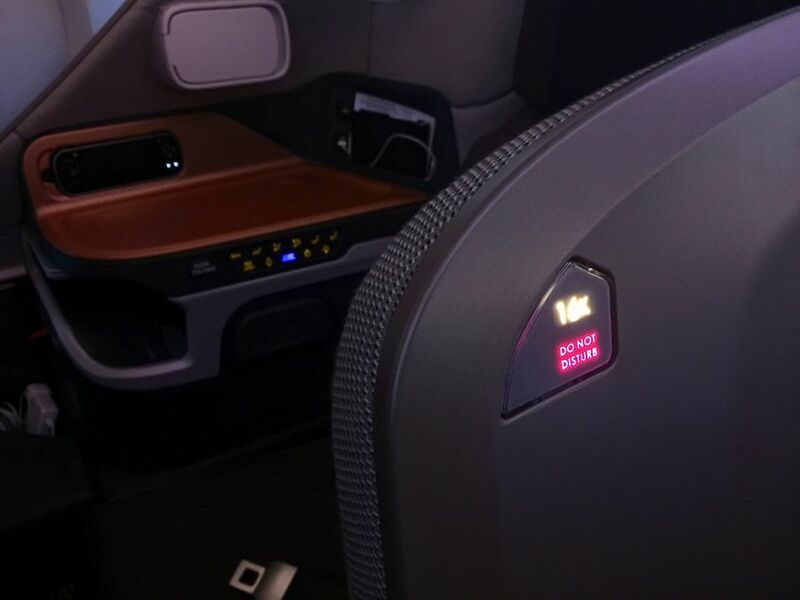 Aesthetically, the cabin and seat benefit from a contemporary yet decidedly elegant palette. The well-cushioned seat – upholstered in leather by Poltrona Frau – is finished in aubergine with copper piping, and those colours are repeated around the seat, along with flecks of grey and blue in the fabric surrounding the inside of the seat shell. 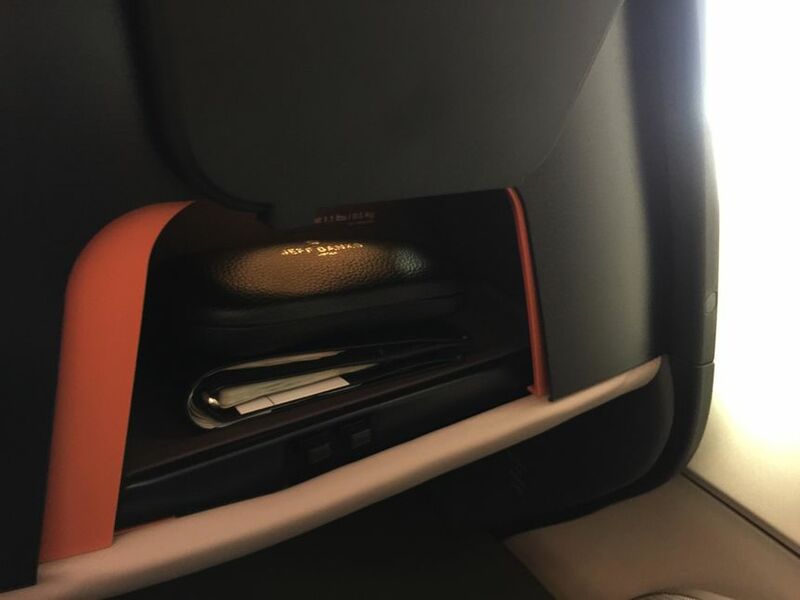 The shell itself is notable for being cast from a carbon-fibre composite material which is both strong and lightweight, and takes advantage of a thinner mounting base to the floor to provide under-seat stowage sufficient for a full-sized cabin bag and a laptop bag or handbag. 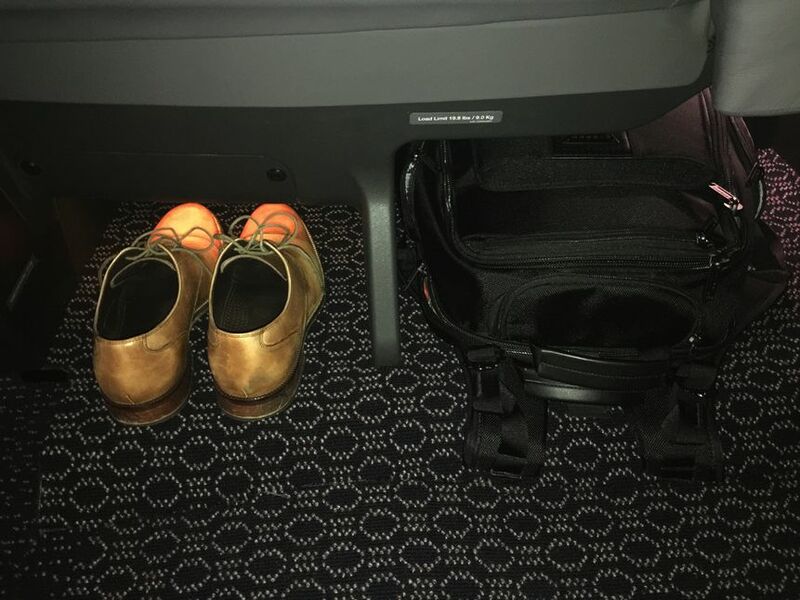 On my flight I travelled with just a laptop bag, so the extra space came in handy for my shoes. 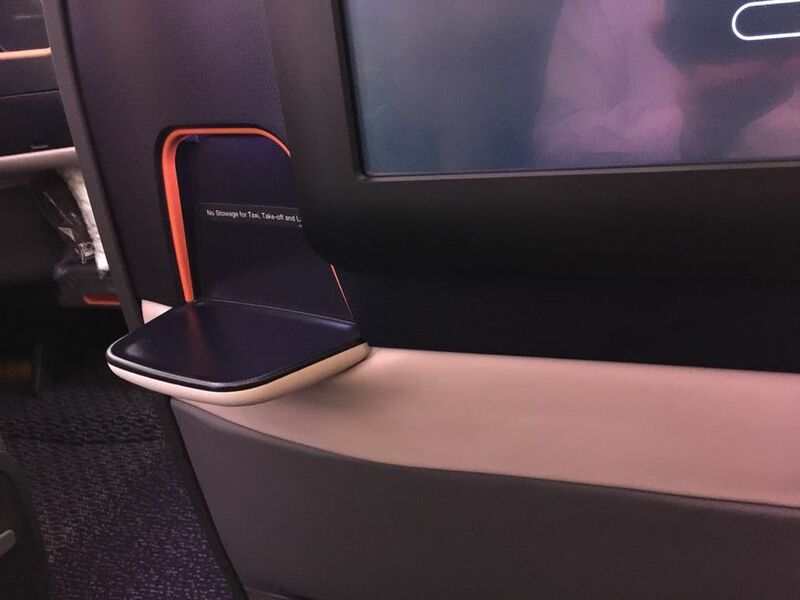 Each window seat has the seat itself positioned immediately next to the aisle, with a wide copper-coloured shelf and the sloping seat shell between you and the window. Travellers who enjoy a sticky-beak will find this frustrating as you have to lean over, and in some cases crane your back around, to get a good look out the window. 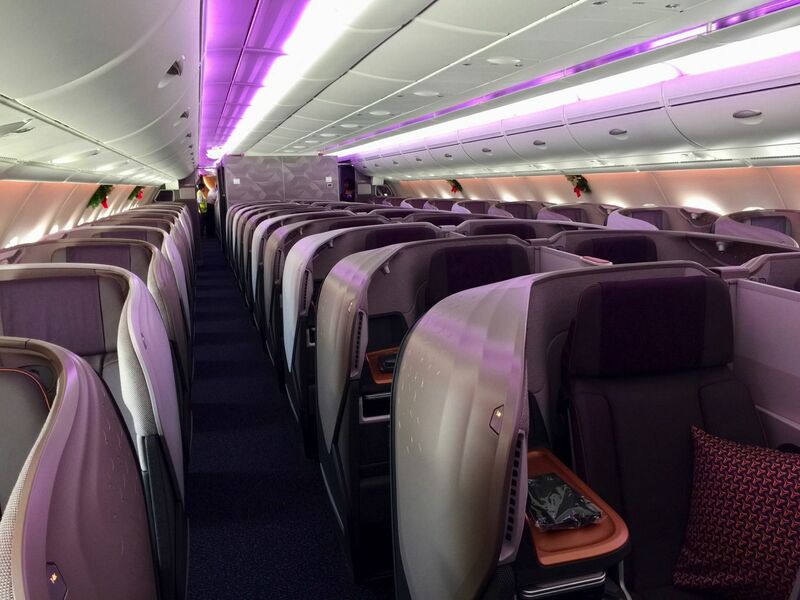 ... with each seat marching in the exact same orientation (rather than the alternating layout of designs like the Qantas Business Suite, which places some passengers at the aisle and others by the window). 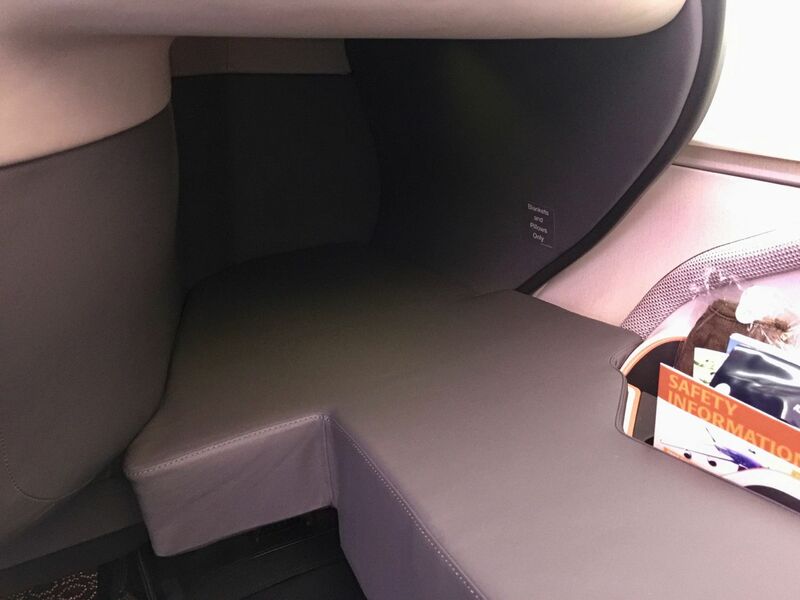 The paired middle seats have a divider which can be pushed halfway down for sociability with your seatmate, or with the flick of a hidden lever be fully collapsed if you’re travelling with your partner and want to sleep side by side. 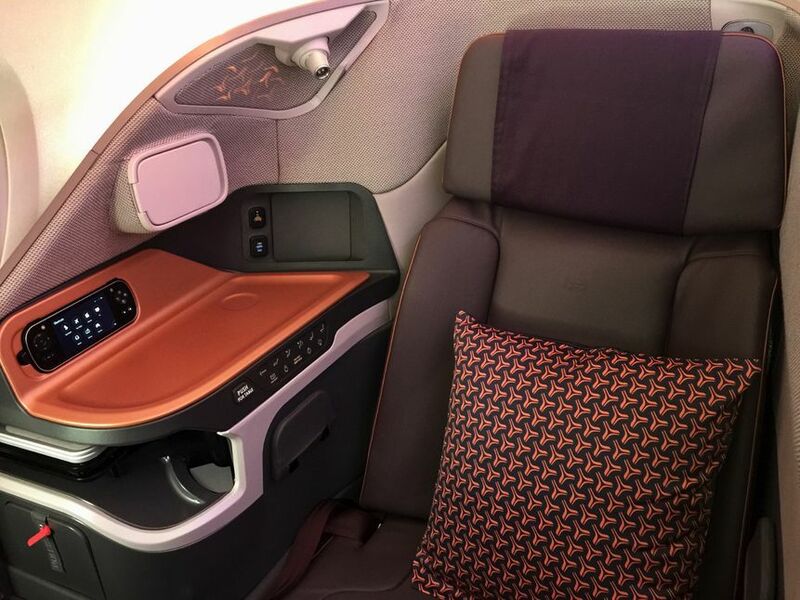 The width of Singapore Airlines’ newest business class seat – or rather, the lack of it compared to its siblings – has raised eyebrows and concerns among many seasoned SQ flyers. 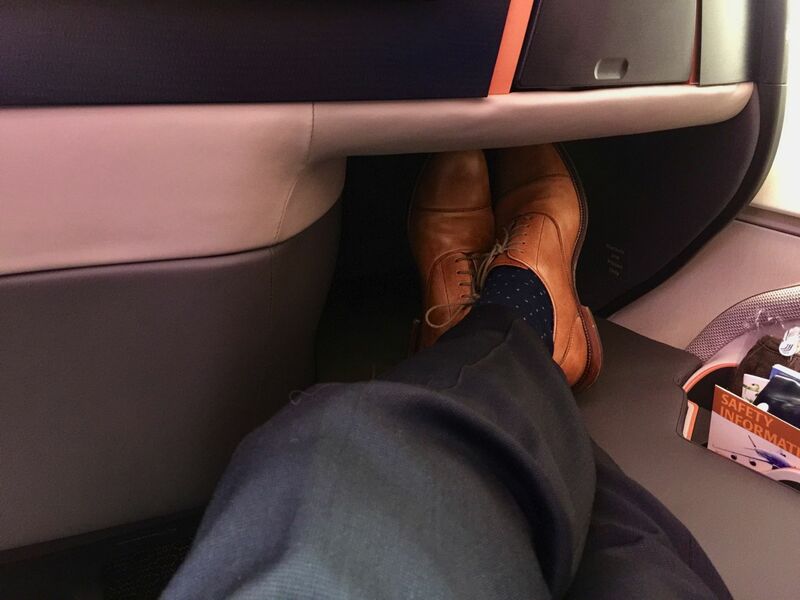 … and thee inches below the 28 inches of Singapore Airlines’ latest Boeing 777 and Airbus A350 business class pews. 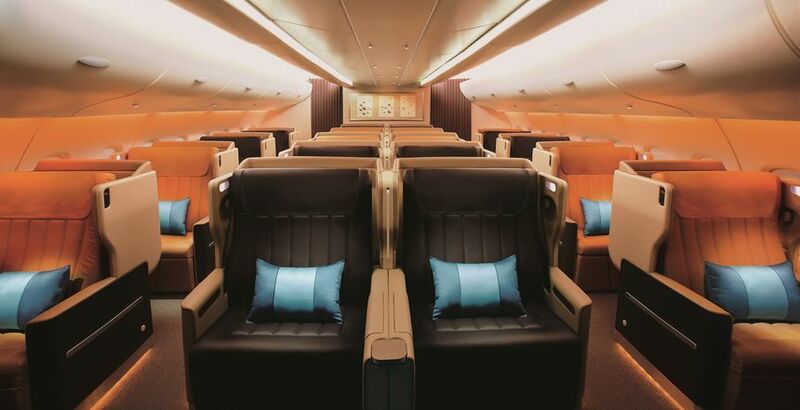 If anything, I’ve always found the 30 inch seat width of Singapore Airlines’ first-gen Airbus A380 business class to be too generous – it almost feels like I’m floating around in the seat, unable to ‘nest’ as I might in a seat of cosier armchair-like dimensions. 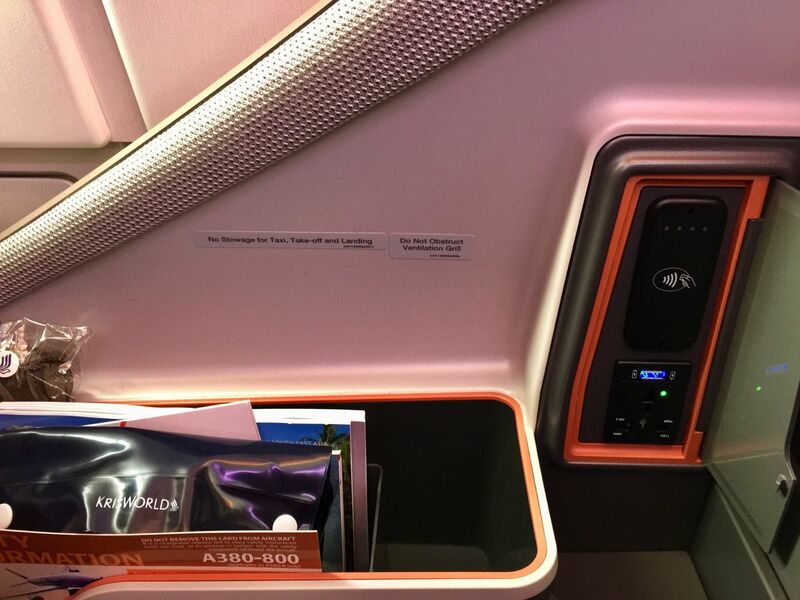 At 25 inches edge to edge, this new A380 business class seat is still plenty comfortable – by way of comparison, it’s a good few inches wider than the latest business class seats of Australia-to-Asia competitors Qantas or Cathay Pacific. But there is a width-related issue all the same. 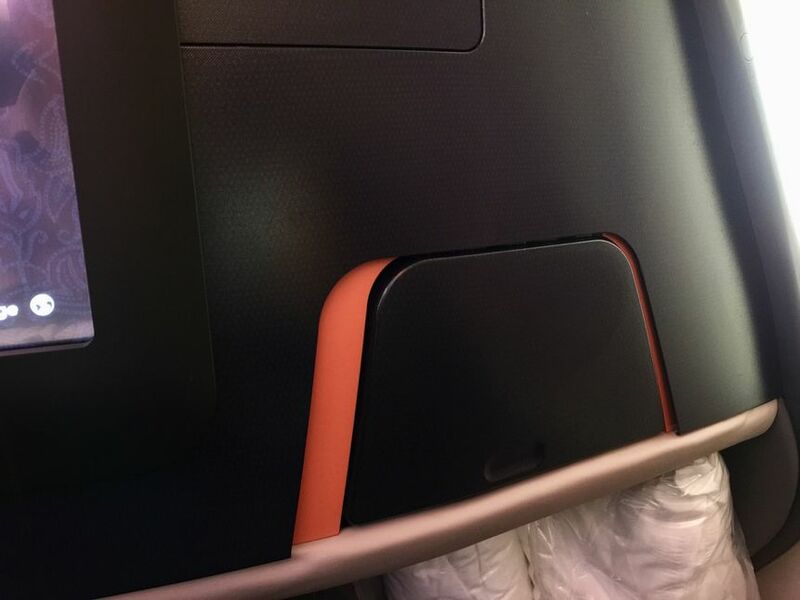 The high and pleasingly padded aisle-side wall felt very close, enough to create a sense of confinement which some travellers might find offsets the gains of privacy. 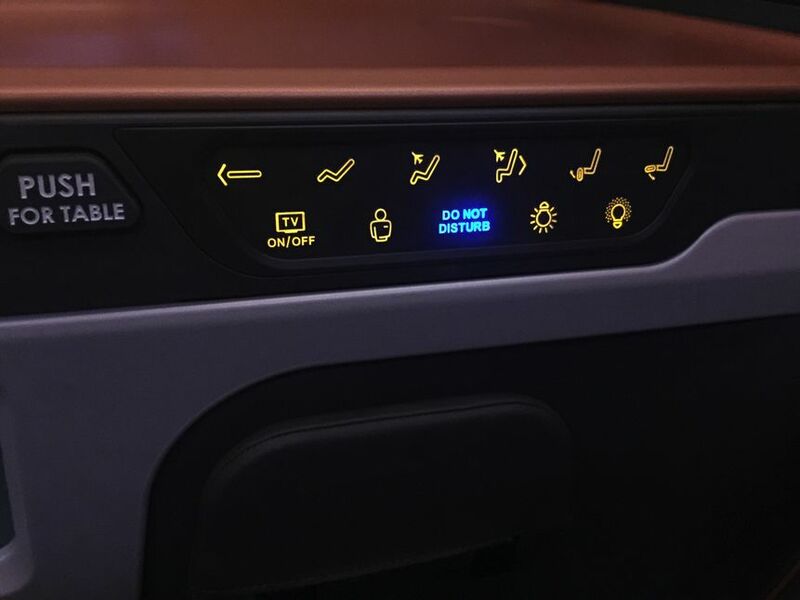 On the other side of the seat, my elbow kept bumping into the control panel and accidentally activating the seat recline function or the call button – despite that, the touch panel requires a deliberately firm and prolonged press rather than a quick tap. Many passengers on this flight were experiencing the exact same issue, which saw the crew constantly scurrying up and down the aisles in response to those ‘false alarm’ stabs of the call button. 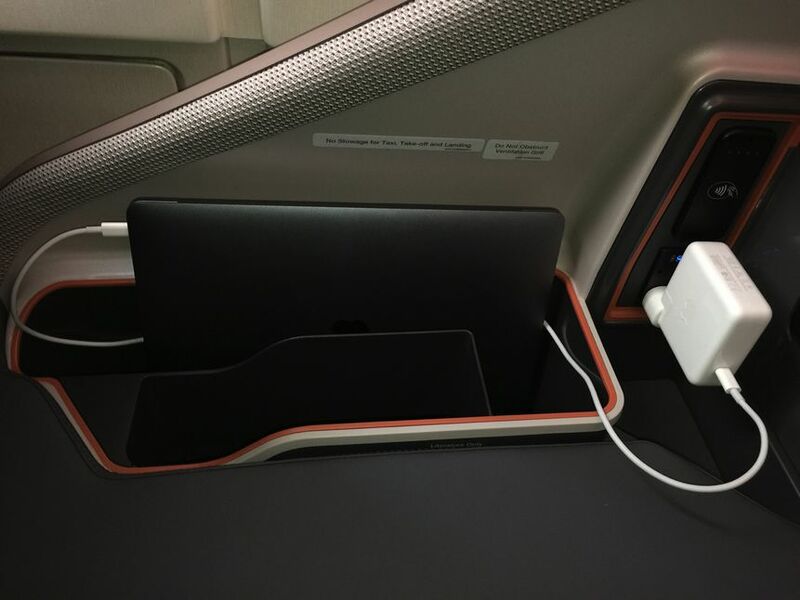 The generously-sized table has ample room for just about any laptop, even a 17-inch behemoth – and the table pivots away from your seat to make it easier to get out of the seat without having to temporarily pack your gear away. 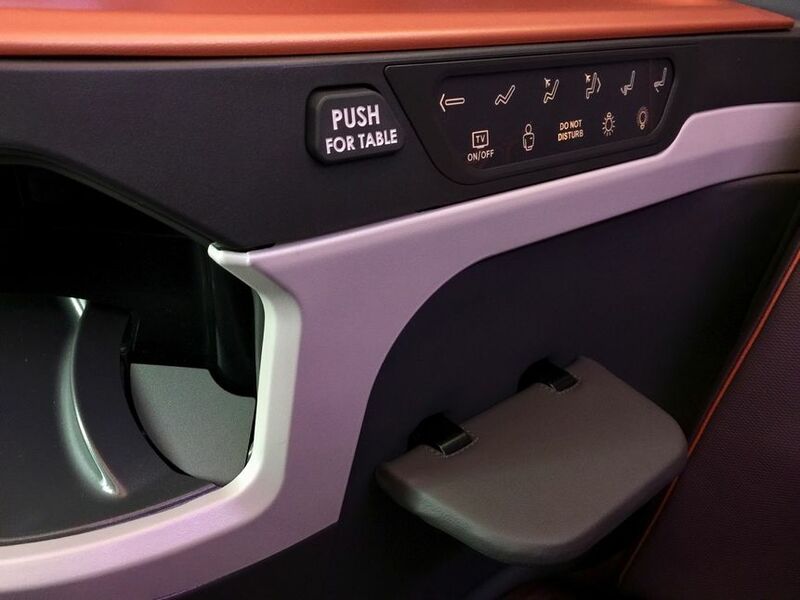 A ‘connectivity panel’ at the side of the seat opens to reveal a universal AC socket and a high-powered USB port. The slim floor-mounted recess near this panel provides the perfect place to stow your laptop while it’s recharging from the adjacent AC socket. You can win back a lot more space for your own stuff if you dump all the airline-issued material (bar the saftety card) into the overhead bin. 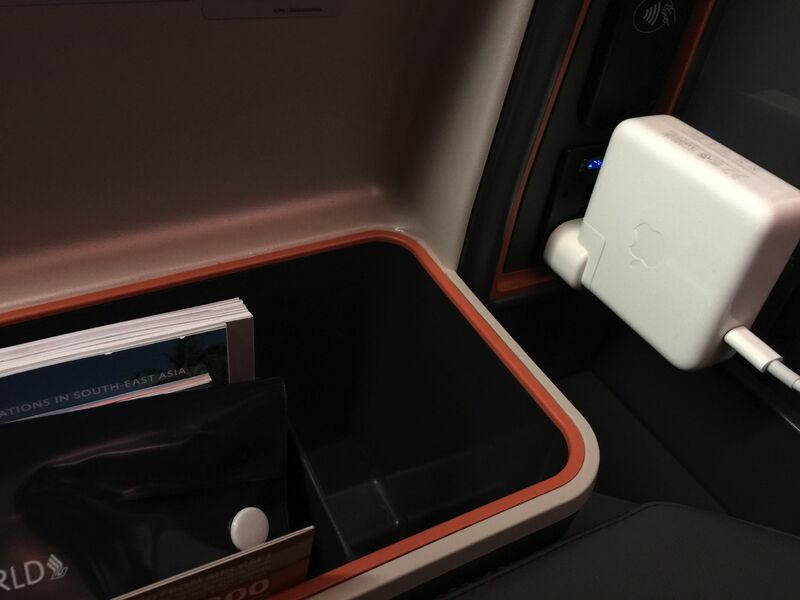 However, the orientation of the AC socket means that plugging in an Apple MacBook power adaptor blocks access to the USB socket directly above the AC outlet. Given how much care has gone into the rest of the seat’s design, this seems like one of those oft-unavoidable ‘Oops’ moments of oversight. Thankfully there’s a second USB port just over your shoulder, at the rear of the console shelf. And this is also a high-power model so it’ll juice up your tablet or large-screen smartphone in extra-quick time. 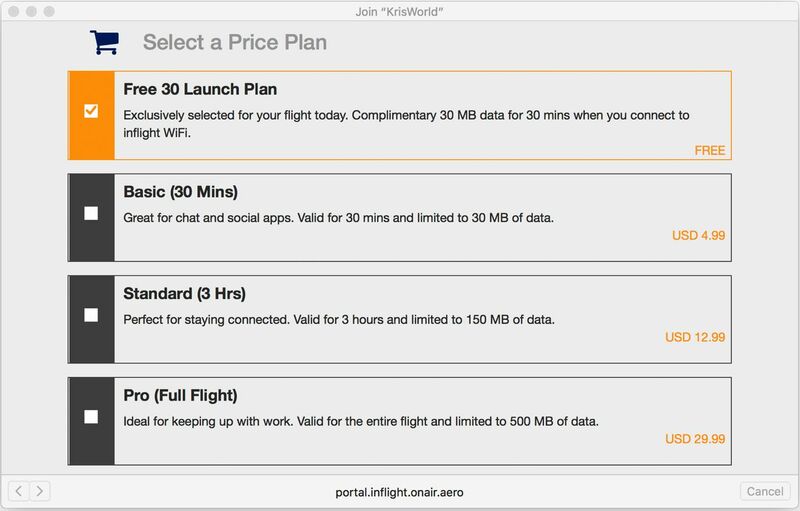 Singapore Airlines’ Airbus A380s are fitted with satellite Internet and offer four packages, from a free sampler of 30 minutes and 30MB through to US$30 to stay online for the entire flight (with a 500MB data cap). The speeds aren’t earth-shattering – we clocked 2.5Mbps – but that’s sufficient for casual work such as Web browsing, email, Office-style apps and social media. 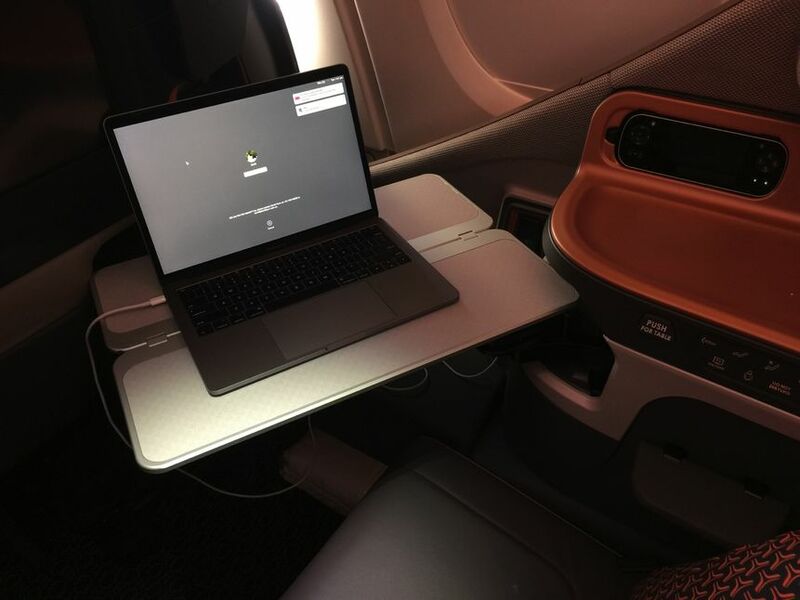 The only real downside of working in Singapore Airlines’ new business class seat – and this is a personal observation which may not apply to all keyboard warriors – is that as I hammered away on my MacBook, my elbows kept hitting the seat’s aisle sidewall and the seat control panel. This certainly won’t be an issue for every traveller, but it goes back to the relatively tight fit of the seat. While the seats themselves are forward-facing, the sleeping position sees you angled towards the window (or the aisle, if you’re in a middle seat). ... and is dressed with a fitted mattress pad, duvet and pillow. 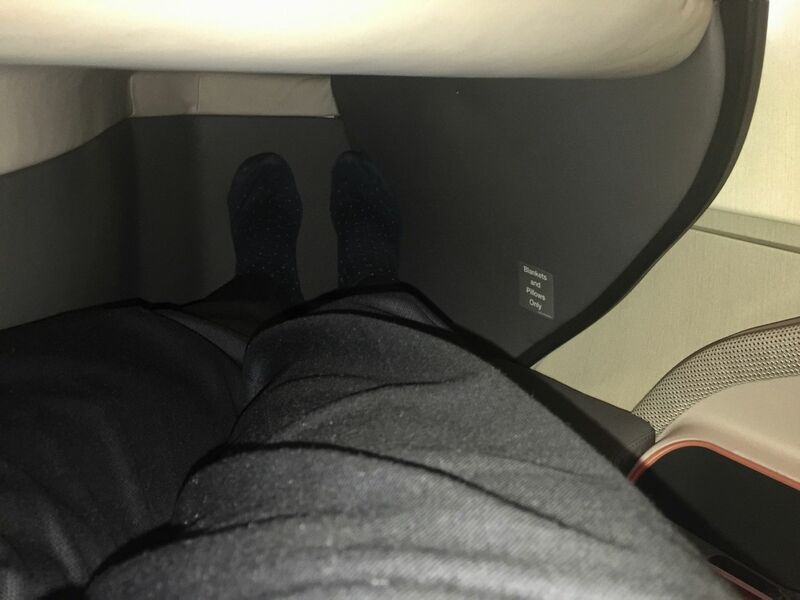 Your feet tuck into a cubby at the far end, which is beneath the shelf of the passenger ahead of you – and this of course can be a relaxed daytime position. My size 8s fitted in the cubby of a regular seat with a bit of wiggle room to spare. I’m of average height (5’9”, or 175cm) and habitually sleep on my back, and the angled sleeping position – while unusual – certainly wasn’t uncomfortable. 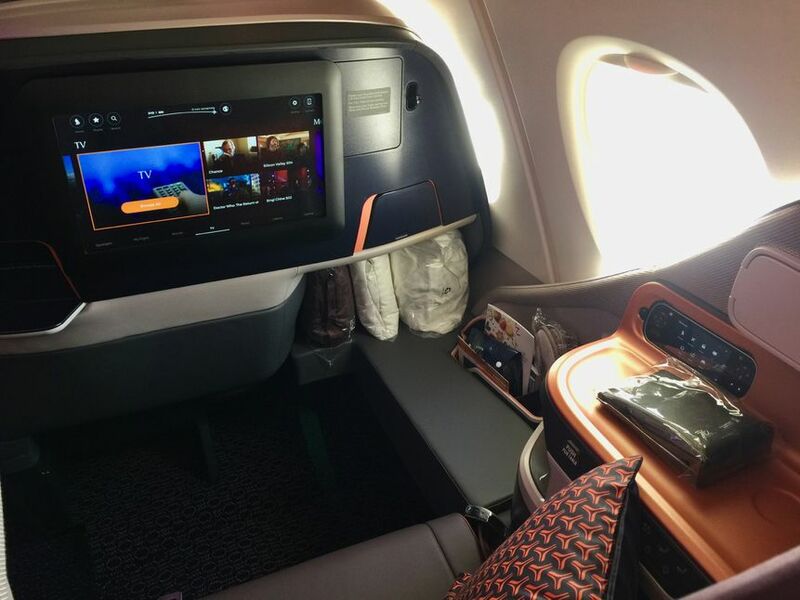 One area where Singapore Airlines aced the design of this new business class seat was in the personal space it provides for passengers, and especially business travellers. There’s that wide shelf just off to one side. 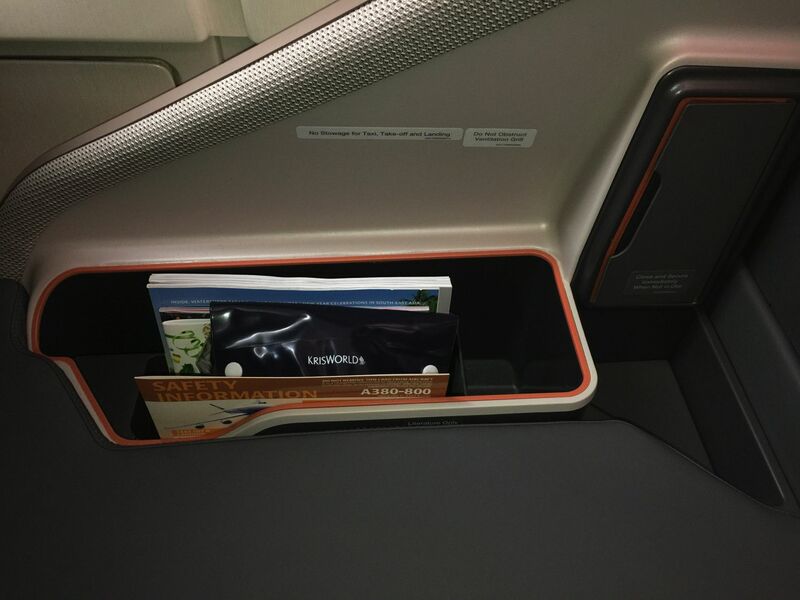 Next to the video screen in each window seat is this handy hole for stowing your reading glasses, travel wallet, amenity kit or gadget bag. The middle seats get a second recess above that one. 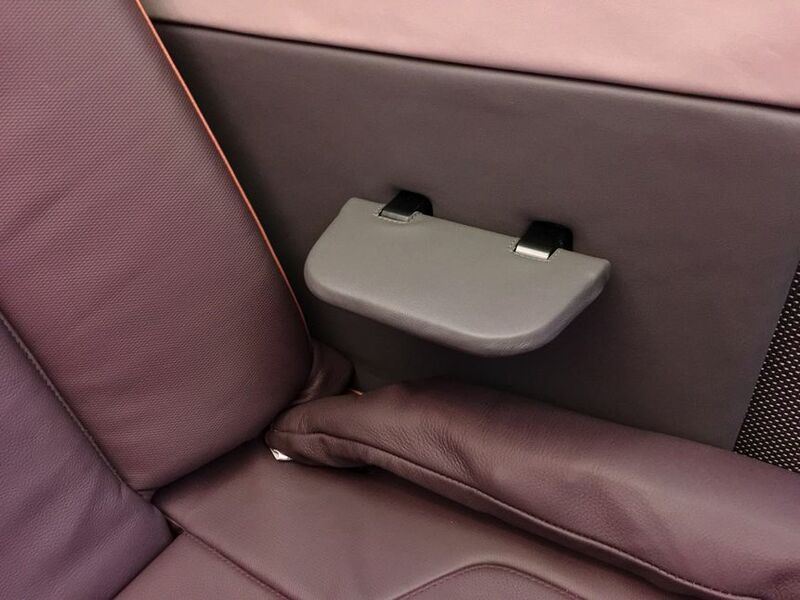 … and two hinged armrests which fold down at either side of the seat. 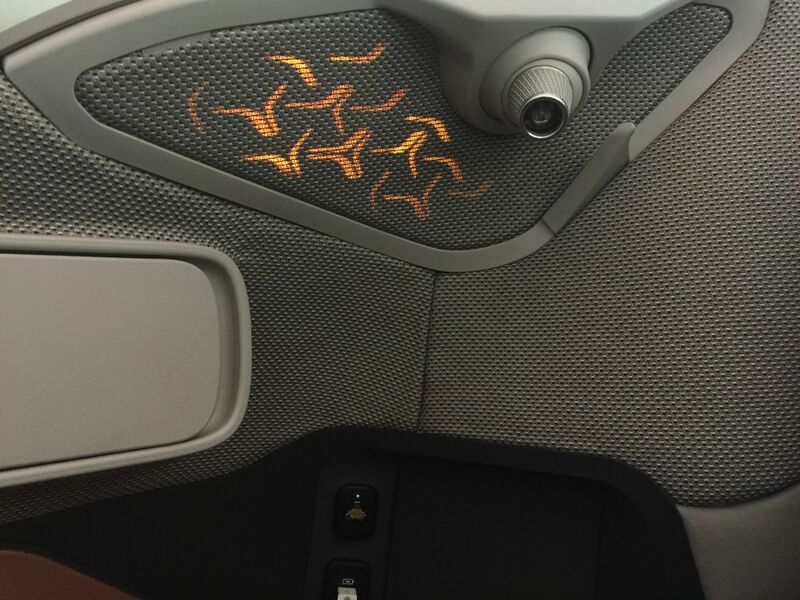 … and a ‘Do Not Disturb’ indicator outside your seat. 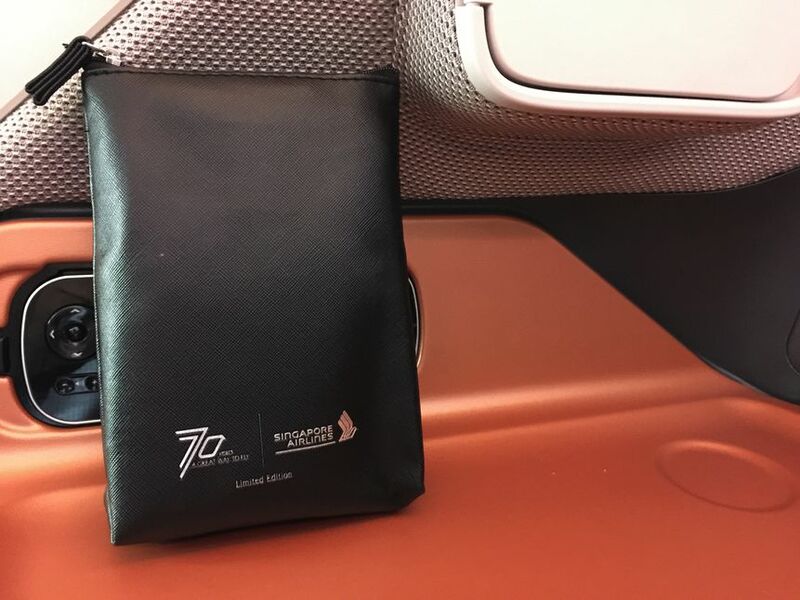 Singapore Airlines doesn’t provide a conventional amenity kit – shave kits and dental kit are available in the bathrooms, along with Penhaligon’s orientally-driven Quercus facial mist, cologne and hand cream. 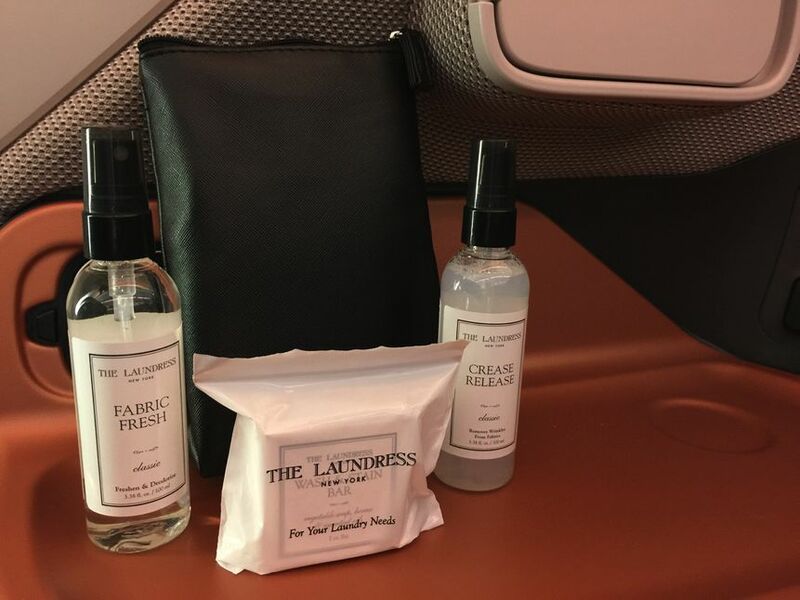 However, each passenger gets a novel ‘limited edition’ laundry kit with fabric freshener, crease remover and a gentle stain-removing soap – a clever touch for business travellers and possibly more useful than the standard amenity kit. 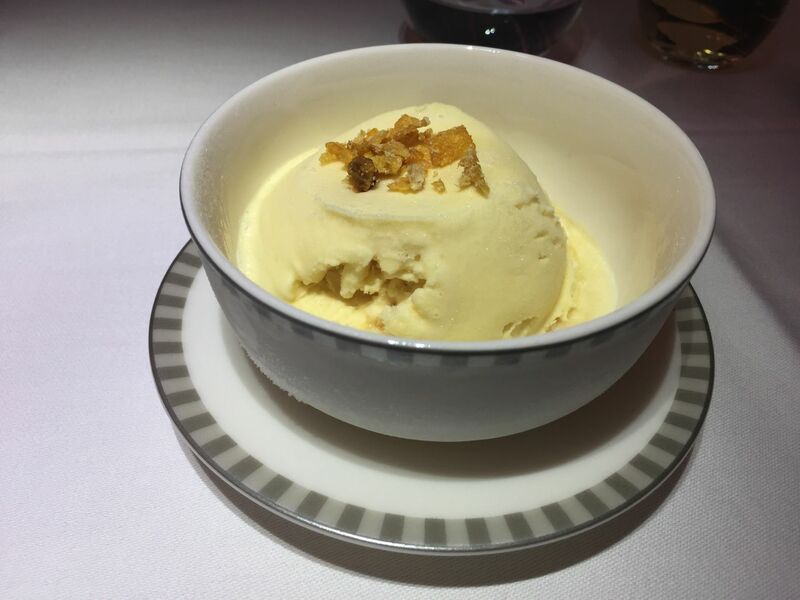 Singapore Airlines has a well-earned reputation for superb meals in business class – and if you don’t want to order from the standard inflight menu, which on our flight listed four tempting main courses for lunch, there’s also the popular Book the Cook advance meal-order service. 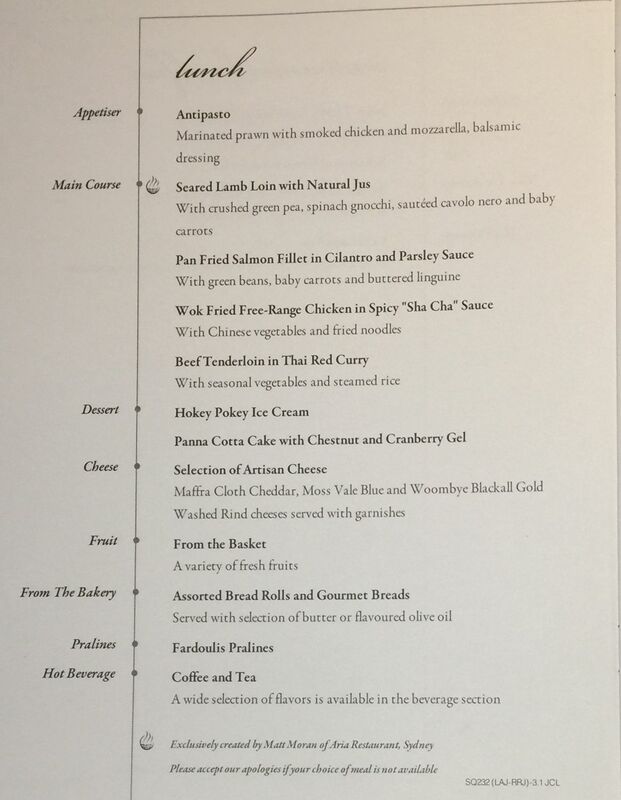 Here’s the menu for my Sydney-Singapore SQ232 flight. 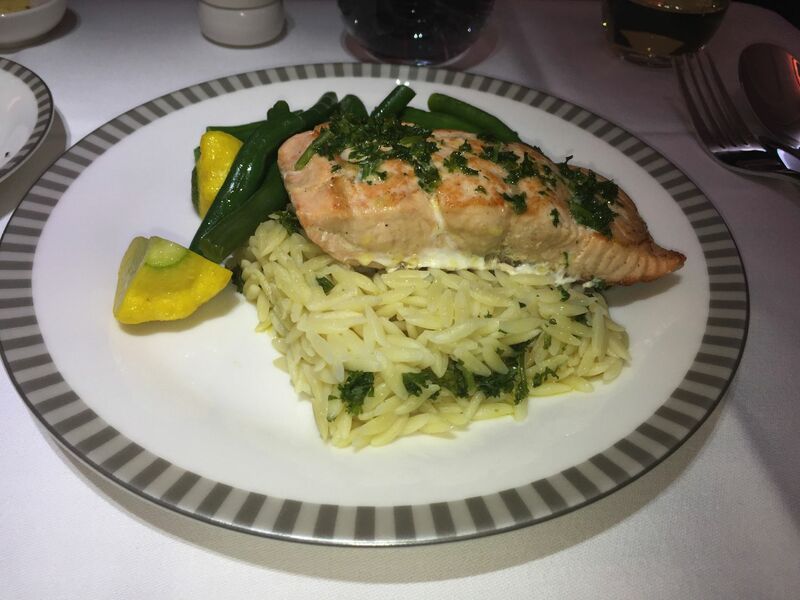 I always go for Book the Cook and from the current menu, a few days before my flight I chose a delicious, light and healthy Tasmanian salmon in wild-lime butter sauce with steamed green beans and pasta. Before that came an antipasto appetiser of marinated prawns with smoked chicken and mozzarella. For dessert I went for the hokey pokey ice cream, which was obviously frozen in its dish and took some patient chipping-away to make a dent in it. 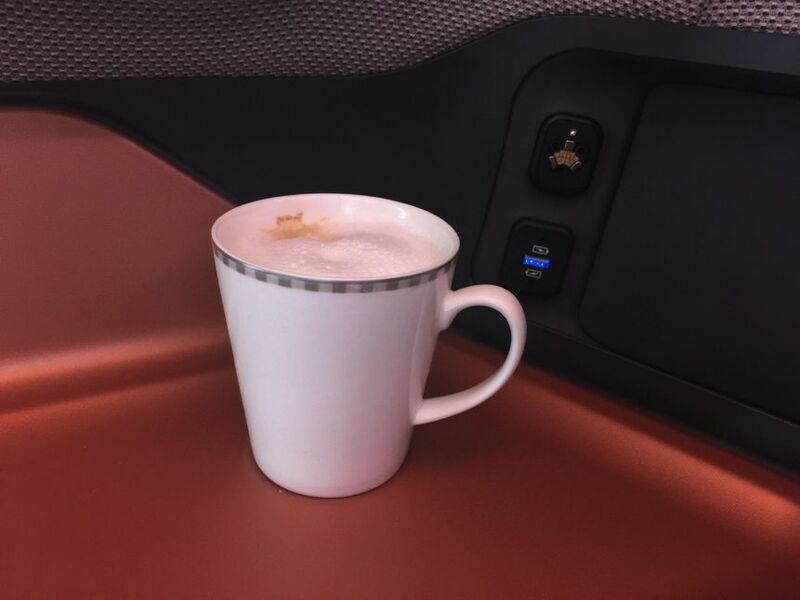 … although the Illy coffee tasted disappointingly thin, bitter and burnt. Between meals I enjoyed a glass (okay, two glasses) of Charles Heidsieck Brut Reserve Champagne, and of course the classic Singapore Sling. Two hours before our arrival into Singapore a second light meal was served, with a choice between spicy Indonesian mee goreng fried noodles with sambal sauce, and a warm tandoori free-range chicken thigh sandwich (it tasted better than it might look). 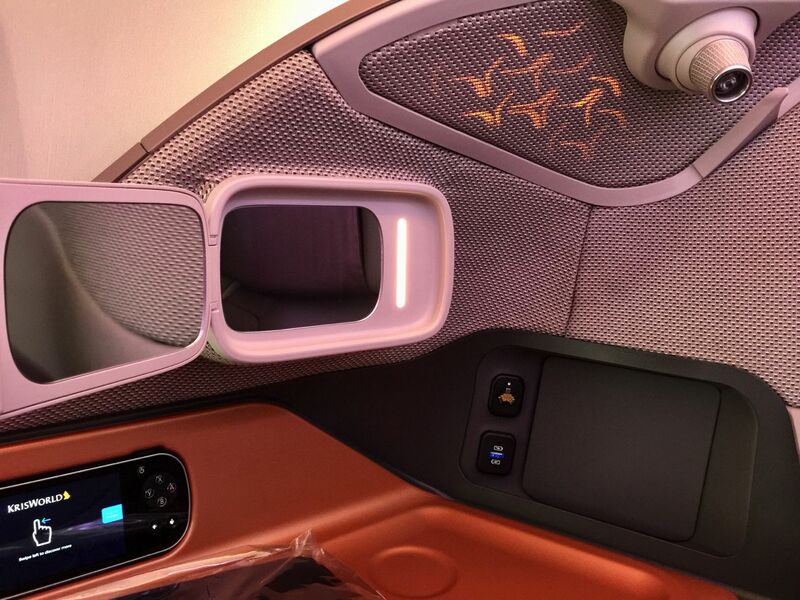 Each business class passenger will find a sizeable 18-inch HD touchscreen parked almost in their face. 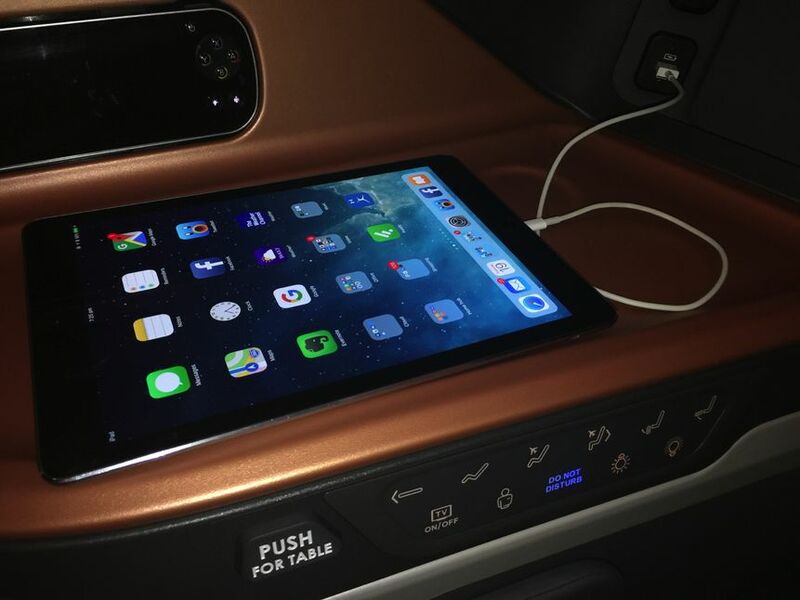 Oddly, the screen doesn’t pivot up or down to adjust the viewing angle to suit if you’re sitting, reclining or lying down in the fully-flat bed. 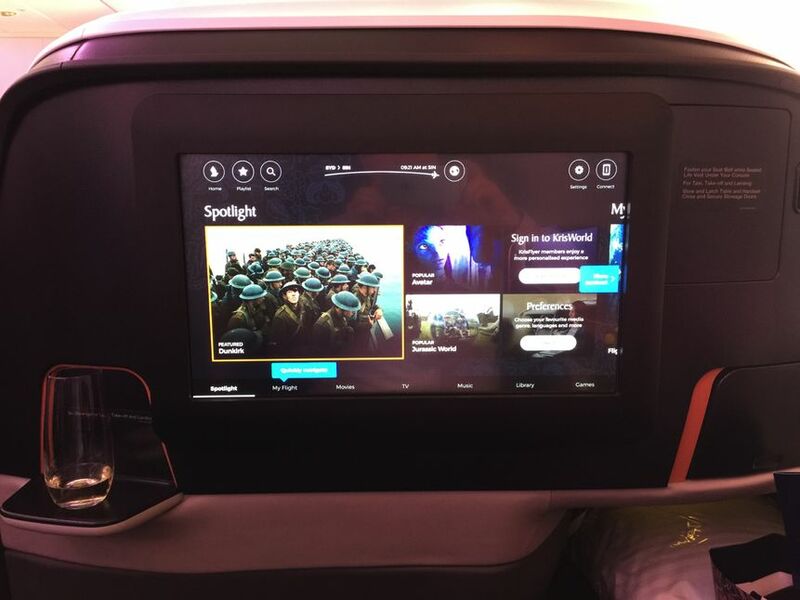 Singapore Airlines’ KrisWorld entertainment system is packed with content, from recent-release movies to boxed sets of popular TV shows, driven by a touch controller. You can also fire up the Singapore Airlines app on your smartphone and link it to the screen to use that device as a controller. 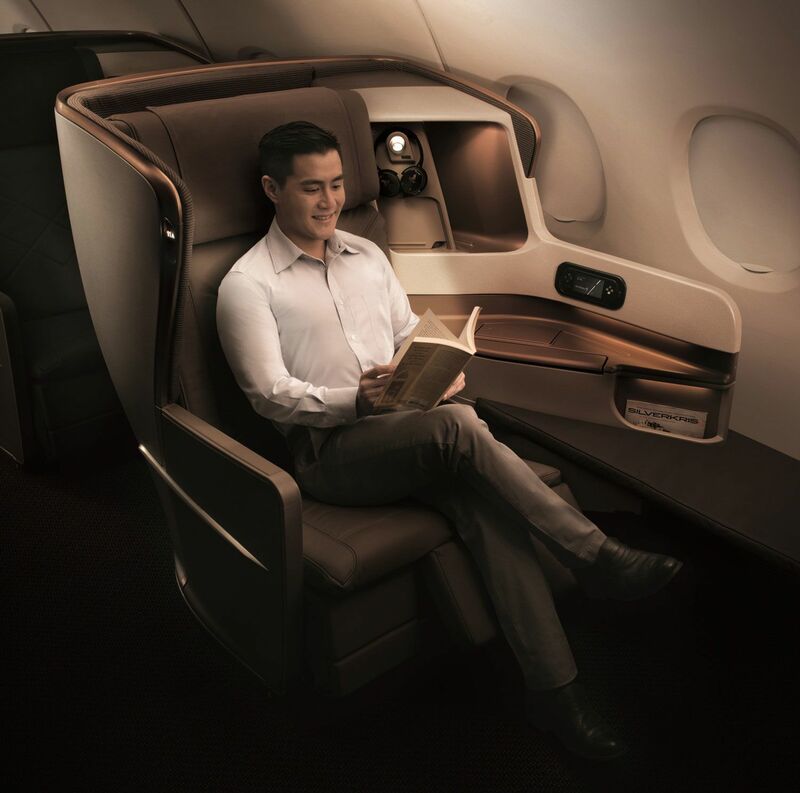 In addition, members of Singapore Airlines’ KrisFlyer frequent flyer scheme can sign into the system to save their personalised playlist and also pick up viewing of a half-watched movie from the previous flight. Is it perfect? No. There are a few small wrinkles. But even allowing for those, when you consider the product as a whole, this is arguably Singapore Airlines’ best-ever business class seat. Travelling on this aircraft in the new year, so I was interested to read this. Seriously, this seat should be perfect - no ifs or buts - given the time and money SQ poured into it with JPA Design. Banging the call button and not having a pivoting screen, among other niggles mentioned, suggest that the seat was not thoroughly user-tested. And what's with those fold down armrests - they don't look particularly comfortable. An after-thought perhaps? And we're still having to sleep diagonally - with feet shoved into a small space, when there are other configurations that avoid this. Sighhh..
excellent review David. Disappointing with that seat width narrowing as practicality has given way to aesthetics. Much prefer the current designs. Shoulders elbows hitting control buttons is always annoying and craning that neck to peek out the window is a backward step. SIA do everything else well however, here they've blinked. i am typing this in the changi terminal 3 lounge having just got off the SQ232 flight 20mins ago. 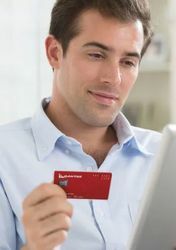 Have relocated to London and my company doesn't have a deal with Qantas so sadly losing my Platinum status, have to rely on LG. 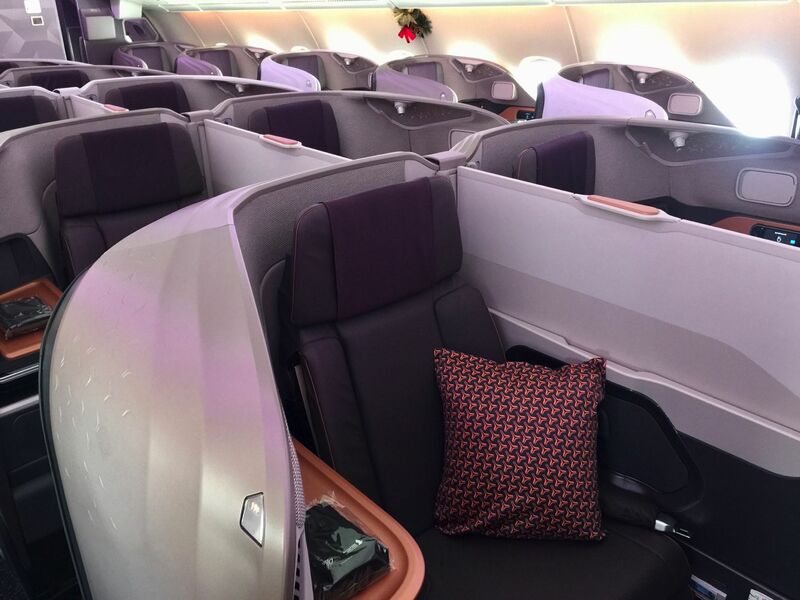 First time ever LHR SYD on SQ tonight, old seat to SIn, new seat from. 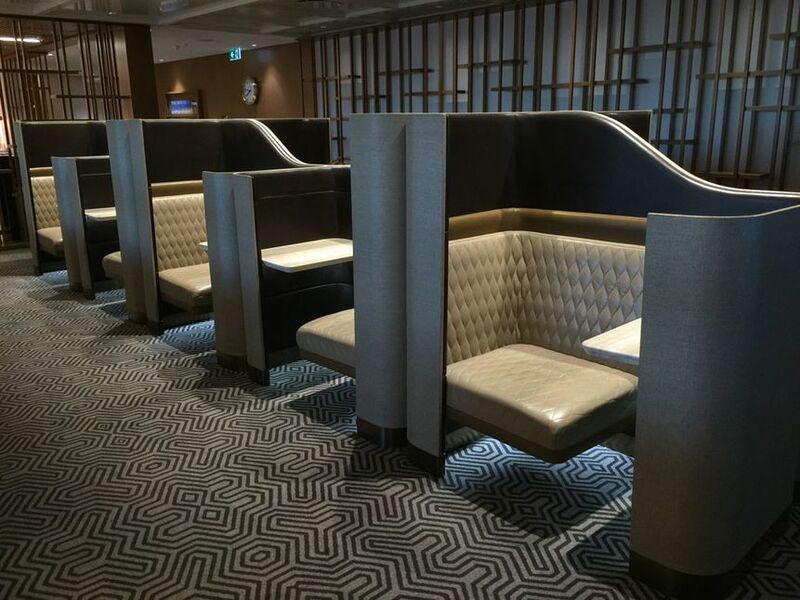 Very interested to see the much vaunted SQ service and will have a direct comparison between the seats. FWIW Krisflyer has matched my status up to Silver, doubt that will make much difference first flight other than bonus miles. I can see that it is basically the old chair with new upholstery and particle bins and shelves but they are a much better use of space. I could also sleep on my side front or back more easily than on the older seat. 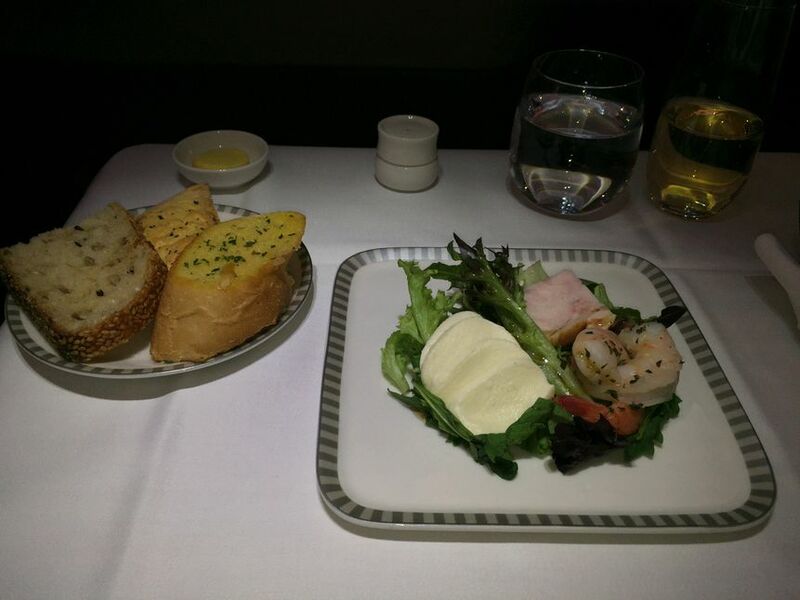 As a side bar I don’t really understand why people see SingaporeAir as a service leap ahead of Qantas. Layout much better than 2x2x2 for privacy but outside that was not blown away. American Airlines business a better product than SQ for me and represents a real leap ahead from that airline’s previous attempt as an example. Flying in 16K in a couple of weeks time. Thanks for your review! 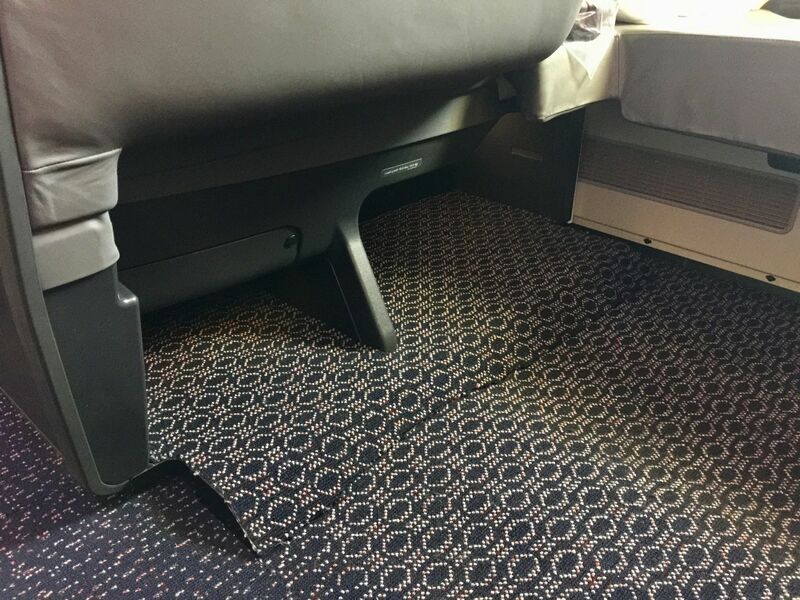 Looking forward to the new business class layout. I’m one who appreciates the feeling of privacy onboard, so I quite enjoy the cocoon-like seating shell and staggered arrangement with respect to the aisle and middle seats. My only major gripe from what I’ve seen of the design online, is the window view being blocked. It seems so odd, I can’t entirely comprehend how someone signed off on that. 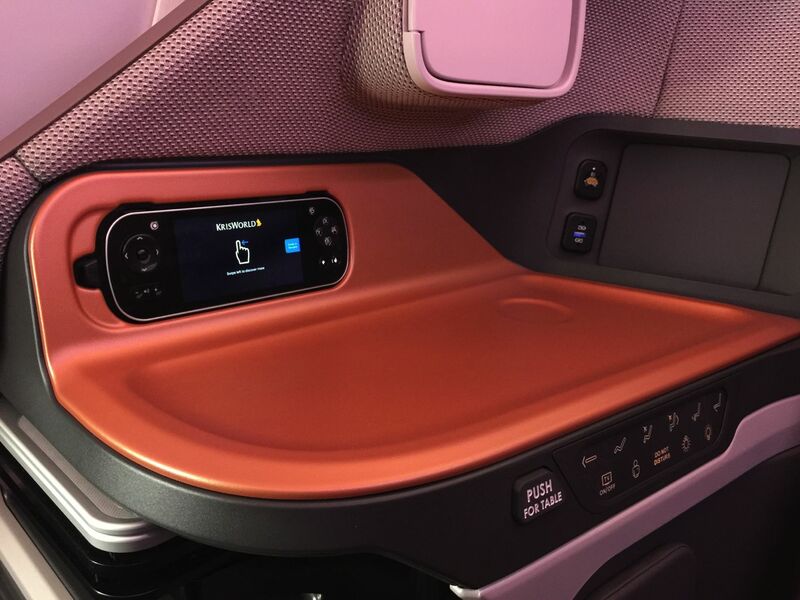 I've just flown on the new SQ 350 BNE > SIN and the only disappointment was the lack of storage space.Otherwise a good product. This 380 seat seems to build form that so I am looking forward to using it. 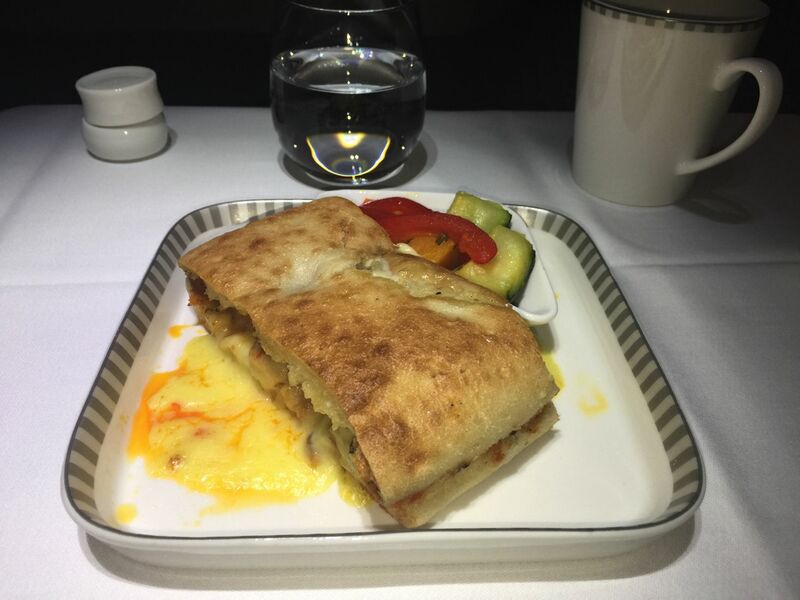 Nice review of SQ New Biz Class. May i know if the seat when change to bed mode is comfortable for sleeping? 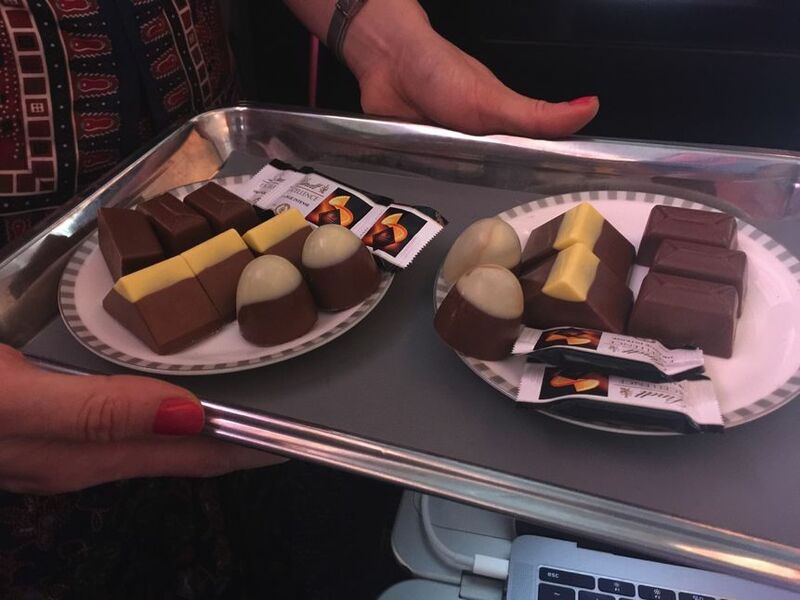 Is it good for 12 hour Long Haul flight? Is the mattress thick enough? Will this seat appear in all their New A350s. I heard they will phase out all their 777s and replaced by A350 for Long Haul. Great review! I used points and booked the SQ252, but today got moved to SQ232... my flight isn’t until August but glad that I’ll get to try the new A380... makes my 6 hour transit seem much more bearable now! Any idea what the rollout plans are for this fit-out? When will it hit 100% of all A380s? 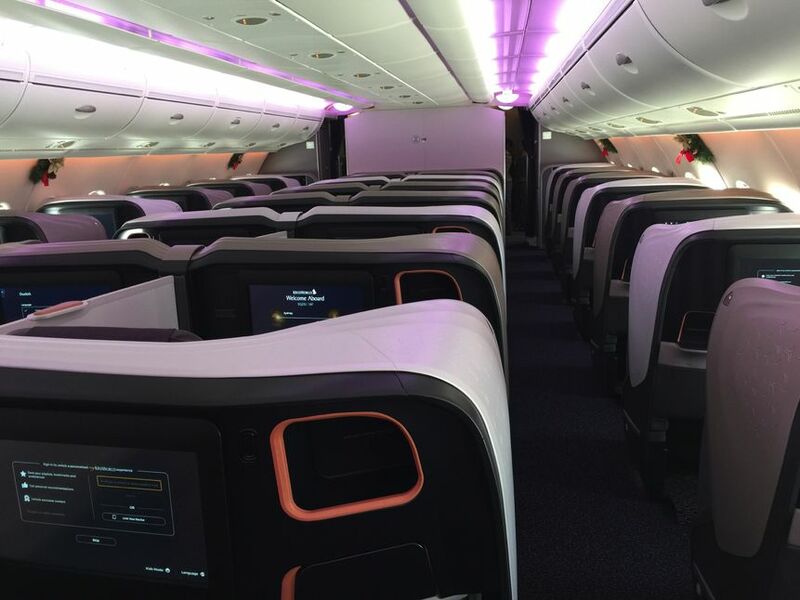 Is there any way to tell whether a route or flight has the fit-out in advance? 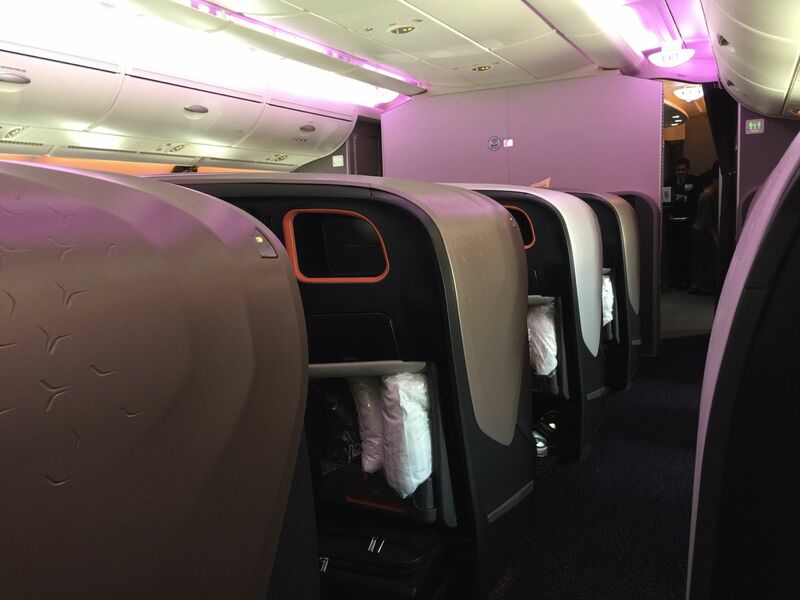 My experience recently in A350 BNE-SIN, A380 SIN-LHR, B777 LHR-SIN and A350 SIN-BNE was disappointing. Three of those four flights were overnight, so I was forced to endure the painful changing from a seat to a bed and back again several times. No sign of the "‘limited edition’ laundry kit with fabric freshener, crease remover and a gentle stain-removing soap" either, aon any of the four flights. 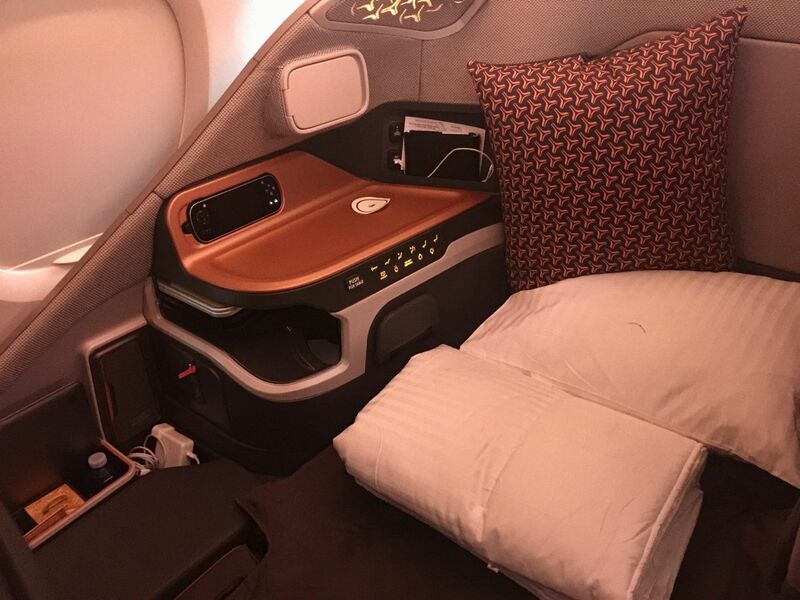 I'm not sure why changing seats to and from a bed during a overnight flight on a relatively short flight have anything to do with the product? 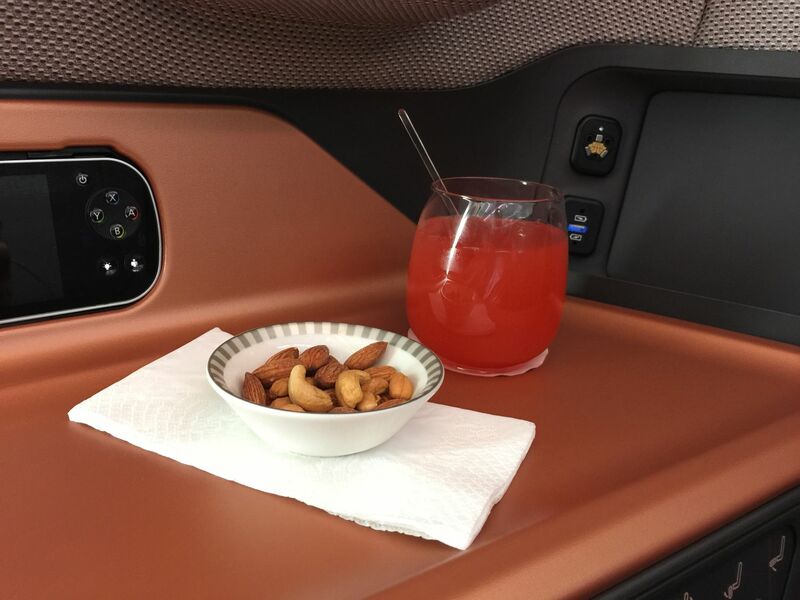 Does anyone know if these business class seats are going into the A350? Have to decide weather to fly from Manchester back to Sydney and try my luck with those seats or fly back from Heathrow to get on the A380. 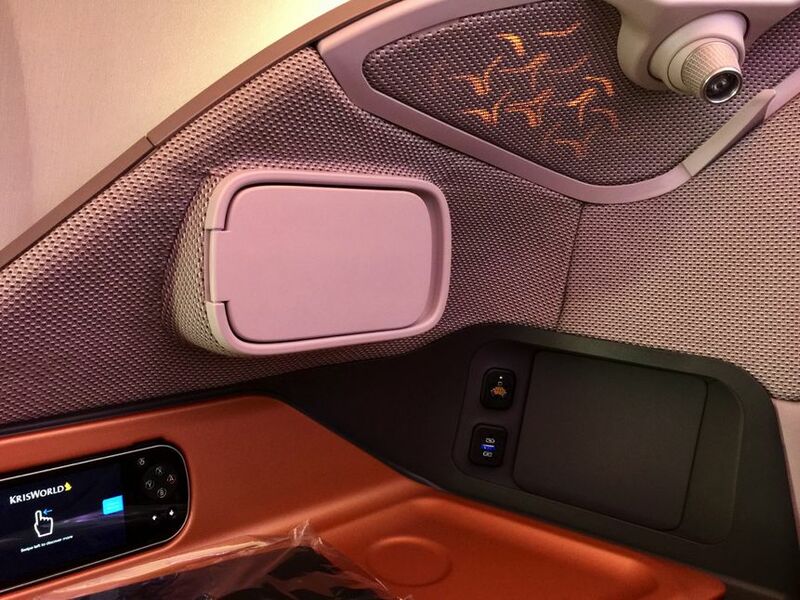 Comment on "Singapore Airlines' new Airbus A380 2018 business class"